Feed is converted into milk by the digestive system (stomachs and intestines) and the mammary gland. All cows can be assumed to have a similar digestive system but the capacity of the mammary gland will vary depending on size of udder and number of milk making units (alveolar cells) which are determined by the genetics of the cow. A conducive environment is required for them to function (the cow must be comfortable and free from pain), just like the workers in a factory. The aim of feeding of dairy cows is to maximize milk yield (by meeting cow’s feed requirements) and to maintain the cow in good health. Proper feeding is essential to ensure animals receive adequate nutrients for maintenance and production, and remain healthy and in good body condition. Dairy cattle must eat a balanced diet. Too little (or poor-quality feed) results in thin animals that cannot resist disease while giving too much feed is wasteful and does not make economic sense. Lack of essential nutrients will result in ill-health, failure to reach full production potential and sometimes death. For cattle, the basic types of ingredients needed are shown in Table below. Micro ingredients. Minerals and vitamins are required in small amounts and fulfil a variety of functions, including forming strong bones and maintaining the reproductive system. A dairy cow, like all other animals requires energy, protein, minerals and vitamins which must be provided in the diet. Also known as basal feeds, these are fibrous plants known as forages and include grass, hay, straw and stovers (stems and leaves of tall cereals such as maize and sorghum). They provide most of the energy and bulk an animal needs and will make up most of the diet. Most contain only low or medium levels of protein. Forage forms up to 30-70% of the diet, depending on level of productivity. Using a feed trough helps to make forage accessible without wastage. These are feeds with a higher concentration of energy or protein or both, i.e. more nutrients per volume or weight of feed compared to forages. Certain forages (e.g. legumes), commercial dairy concentrates and cereal by-products are high in protein. They are fed in relatively small amounts together with the bulk feeds and are most often fed to productive animals such as lactating or pregnant cows. Protein feed should not exceed 30% of total feed since proteins cannot be stored in the body and will be In addition, extra energy is (which would otherwise be used for milk production) is used to remove the extra protein (nitrogen) from the body in form of urea in the urine. Dairy cattle require at least 17 minerals and three vitamins in their diet for optimal milk production, reproductive performance, and herd health. Although classical mineral or vitamin deficiency symptoms are rare, in many cases under- and overfeeding of certain minerals and vitamins does occur. Even small imbalances or deficiencies can develop into reproductive, health, and milk production problems. As herd milk production increases, it becomes more critical to balance and fine-tune the dairy herd’s mineral and vitamin feeding program. Generally, the two sources of minerals include natural feeds (forages and grains) and mineral supplements to balance the minerals present in the forages and grains. Minerals can be fed using several methods. Force Feeding: recommended way of feeding minerals to dairy cows as it eliminates palatability problems, daily and cow-to-cow variation in intake, and over- consumption of minerals. The optimal method of force-feeding is in a total mixed ration. Another commonly used method of force-feeding is use of a grain carrier. Free Choice: This method is not as accurate as force-feeding, and only trace- mineralized salt should be fed free choice. Topdressing: This method is used often in stall fed cows where individual feeding practiced. Vitamins fall into two groups: fat soluble and water soluble. The water soluble vitamins are synthesized in the rumen thus only the fat soluble (A, D, E) are required in the diet. Vitamin K is not required in the ration because it is synthesized in the rumen. Although water is not a nutrient as such, it is essential for life. Water can be obtained from feed and/or drinking. Lactating cows need larger proportions of water relative to body weight than most livestock species since 87% of milk is water. The amount required depends mainly on milk yield, water content of feed, amount of feed consumed, salt content of feed and the environmental temperature. Except for high moisture content, an increase in the other factors increases water requirement. Cows will drink more water if it is availed at all times and when warm water is offered on cold days. Dairy cows suffer from a limited intake of water more quickly and severely than from a deficiency of any other dietary nutrient. Lack of water has a big effect on feed intake (especially if the feed is low in moisture) and thus on milk yield. During formulation of dairy cow rations, the daily requirements for all the above nutrients must be taken into consideration. The available feed resources should then be mixed to meet the cow’s nutrient requirements, which are dependent on bodyweight, milk yield, reproductive (pregnancy) requirements and growth. A balanced ration will consist of combined feed ingredients which will be consumed in amounts needed to supply the daily nutrient requirements of the cow, both in correct proportion and amount. A ration will be balanced when all the required nutrients are present in feed eaten by the cow during a 24hr period. Balancing a ration for animals that are not confined (grazing) is a difficult task since grazing animals can choose how much to graze and can select while grazing to improve the quality. Under these circumstances, amount of supplementation can only be estimated depending on quantity quality of the available pasture. When a ration is not balanced, the cow eats some nutrients in excess or in insufficient amounts. Some excesses and deficiencies, if not checked, can lead to death (eg calcium deficiency resulting in milk fever). However, some imbalances are difficult to identify because they result in some degree of loss thus not permitting the cow to exploit its genetic potential. A properly balanced ration will therefore be a mixture of all the ingredients. Total mixed ration (TMR) is a feeding method that helps achieve the mixing a balanced ration. TMR is defined as a mixture of all diet ingredients (roughage, concentrates, mineral supplements and additives) formulated to contain specific amount of nutrients, mixed thoroughly to prevent separation and fed at free will to the cow. Feeds (ingredients): Nutrient composition (can be obtained from laboratory analysis or estimated from text book values) and cost. Cow: Body weight, expected milk yield and estimated amount of feed the cow can consume in one day. This allows the formulator to ensure that all the required nutrients are included in the amount of feed that can be consumed in one day. The formulation should be done by a qualified person for the different groups of animals on the farm based on each group’s requirements. As much as possible locally available feeds should be utilized. The TMR feeding regime has several advantages compared to feeding ingredients separately as cows are able to consume high amount of feed especially in early lactation when high intakes are helpful and increase milk yields. TMR also allows greater accuracy in ration formulation and energy and protein are used more efficiently by rumen bacteria resulting in higher production. Use of TMR improves milk fat test, minimises digestive upsets, eliminates need for minerals supplements, allows use of less palatable ingredients and eliminates need for concentrate feeding at milking. For the implementation of a good TMR program, there will be need for weighing equipment, estimation of dry matter content of ingredients and a qualified nutritionist to formulate the ration. During the formulation of rations for lactating dairy cows, the quality of the ration should be commensurate with the requirements of the cow. The requirement is directly related to the milk yield, which is in turn dependent on the stage of lactation. As such, cows in early lactation will require more nutrients compared to those in late lactation. Since it is not practically possible to formulate a separate ration for each cow, the cows should be fed in groups (strings) with common nutrient requirements. Cows in the same stage of lactation will have almost similar requirements and can therefore the rations can be formulated according to the phase (stage) of lactation. During this phase, milk production increases more rapidly than feed intake resulting in higher energy demand than intake leading to a negative energy balance. This results in mobilisation and use of body reserves and loss in body weight (negative energy). The energy is mobilised from fat reserves, protein from muscle and calcium and phosphorus from bones. However, energy is most limiting. The health and nutrition of the cow during this phase is critical and affects the entire lactation performance. The cow is expected to achieve peak production during this phase, failure to which the lactation milk yield is reduced. Excessive weight loss may be detrimental to cow’s health and reproductive performance (cow may not come on heat at the optimum time) leading to long calving intervals. Concentrates should be added to the basal diet to increase the energy and protein content as forage alone will not be sufficient. Cows that are poorly fed during this early phase do not attain peak yield and milk production drops from week 1.
concentrates should be limited to 50-60% of diet dry matter, the rest being forage to ensure rumination (proper function of the rumen). If high amounts of concentrate are fed during this time buffers (chemicals that reduce the acid in the rumen and available commercially) can be helpful. At this stage, high protein content is important since the body cannot mobilise all the needed protein and bacteria protein (synthesized in the rumen by bacteria) can only partially meet requirements. A ration with protein content of 18%CP is recommended for high yielding cows. If the cow is underfed during this stage, milk production cannot recover even when balanced rations are fed at later stages. This is attributed to the fact that cows in later stages of lactation use energy more efficiently to restore body reserves than for milk synthesis. It should be noted that cows come on first heat during this phase and regaining a positive energy balance is critical in achieving this. During this phase the dry matter intake is adequate to support milk production and either maintain or slightly increase body weight. Feeding should be to maintain production peak as long as possible. Decline of 8-10%/month in milk production are common after peaking. The forage quality should still be high and a CP content of 15-18%. Concentrates high in digestible fibre (rather than starch) e.g. wheat or maize bran can be used as energy source. During this phase feed intake and milk production decline. The feed intake meets energy requirements for milk production, restoration of body reserves and body weight increases. The body weight increase is due to replenishment of body reserves and, towards the end of lactation, due to increased growth of foetus. It has been shown that it is more efficient to replenish body weight during late lactation than during the dry period. The animals can be fed on lower quality roughage and limited amounts of concentrate compared to the other two phases. During this phase the cow continues to gain weight primarily due to weight of foetus. Proper feeding of cow during this stage will help realise the cow’s potential during next lactation and minimise health problems at calving time (milk fever and ketosis). At the time of drying, cows should be fed a ration to cater for maintenance and pregnancy but two weeks before calving, the cow should be fed on concentrates in preparation for next lactation. This extra concentrate (steaming) enables the cow to store some reserves to be used in early lactation and to adapt rumen microbial population to digest concentrates in early lactation to minimise digestive disturbances. During this phase the cow can be fed good quality forage or poor quality supplemented with concentrate to provide 12% CP. The cows should not be fed high amounts of concentrate to avoid over conditioning. If the diet is rich in energy, intake should be limited. Bulky roughages can be fed to help increase rumen size to accommodate more feed at parturition. The amount of calcium and phosphorous fed should be restricted during the dry period to 0.4% and 0.25% to minimise incidences of milk fever. There are several types of commercial concentrates available in the market for feeding dairy cows, the most common being ‘Dairy Meal®’. Concentrates can also be home made using locally available ingredients. It should be noted that feedstuffs available in the market e.g. bran (wheat or maize), pollard or maize germ are not similar to the mixed concentrate as they are low in protein and minerals and should be used in combination with other ingredients when supplementing forages. The maximum amount of milk that can be produced without concentrate supplementation will depend on the quality of the pasture or forage. This has been reported to vary from 7-20 kg milk per day. Several guidelines have been suggested on the amount of concentrate that should be fed to a cow. The only accurate one is the one calculated based on the cow’s nutrient requirements and the quality of the basal diet by a nutritionist. The example below is one of the many guidelines. Up to 7 kg of milk comes from the basal forage diet. For every extra 1.5 kg milk above 7 kg, give 1 kg dairy meal. The lactating cow is given increasing amounts of concentrate as long as it continues to respond by increased milk production (has been referred to as lead feeding as the cow is led to produce more milk). This can be recommended only if the extra milk produced can offset the added cost of the concentrate. Since underfeeding in early lactation can result in reduced milk production throughout lactation and delayed coming on heat, it is advisable for farmers who have limited resources to buy concentrates to feed more in early lactation and none towards the end of lactation. Body conditioning of dairy cows can be used to assess the feeding regimes in dairy cattle. Body condition scoring can be carried out by the farmer through initial training and gets more accurate with experience. Several systems have been suggested but the 1-5 scoring has been the most used. The animals are scored based on the protrusion of the hooks (tuber coxae) and the pins (tuber ischii) and the depression under the tail head (see figure and pictures below. Pasture and fodder production is rain fed and thus seasonal resulting in times of plenty and times of scarcity. The aim of conservation is to harvest the maximum amount of dry matter from a given area and at an optimum stage for utilization by animals and allow for regrowth of the forage. The two main ways of conserving fodder are making hay or making silage. Hay is fodder conserved by drying to reduce the water content so that it can be stored without rotting or becoming mouldy (reducing moisture content stops microbial growth). The moisture content should be reduced to about 15%. The grasses that are very suitable for hay making include Rhodes grass, Lucerne and vetch. Harvest the fodder for haymaking when flowering is 50%. At this stage protein and digestibility are at maximum, after which they decline with age. The fodder should be harvested after 2 to 3 days of dry weather so that drying will be possible. Where possible, drying should be done under shade so that the dried fodder retains its green colour, which is an indicator of quality. Turn the fodder using farm fork to ensure even drying. Check the dryness by trying to break the stem. If it bends too much without breaking, there is still much water. Legumes and grasses can be mixed to make better-quality hay, e.g. Rhodes grass + lucerne. Baling the hay allows more material to be stored in a given space. A good estimate of the amount stored makes feed budgeting easier. Baling can be manual or mechanized, manual baling being more economical for small-scale dairy farmers. Manual hay baling is done using a baling box with dimensions 85 cm long x 55 cm wide x 45 cm deep, open on both sides. If the hay is well pressed, the box will produce an average bale of 20 kg. Hay should always be stored away from direct sun and rainfall, e.g. in hay barns. Rodents like rats should be controlled as they can damage the hay. Napier grass should be harvested at about 1 metre when protein content is about 10%. Maize and sorghum should be harvested at dough stage, that is when the grain is milky. The grains will provide water-soluble sugars and molasses is not necessary when ensiling. When ensiling napier grass, molasses should be added to increase the sugar content. To improve silage quality, poultry waste and legumes like lucerne and desmodium may be mixed with the material being ensiled to increase the level of crude protein. A silo is an airtight place or receptacle for preserving green feed for future feeding on the farm. Silos can be either underground or above ground, the qualification being that the silo must allow compaction and be air tight. Five types are described here: tube, pit, above-ground, trench and tower. Silage can be made in large plastic sacks or tubes. The plastic must have no holes to ensure no air enters. This is popularly referred to as tube silage. Silage can also be made in pits that are dug vertically into the ground and then filled and compacted with the silage material. An above-ground silo is made on slightly slanted ground. The material is compacted and covered with a polythene sheet and a layer of soil is added at the top. When finished, it should be dome-shaped so that it does not allow water to settle at the top but rather collect at the sides and drain away down the slope. The trench silo is an adaptation of the pit silo, which has long been in use. It is much cheaper to construct than a pit silo. Construction is done on sloping land. A trench is dug and then filled with silage material. This method is ideal for large-scale farms where the tractor is used. Drainage from rain is also controlled to avoid spoiling the silage. Tower silos are cylindrical and made above-ground. They are 10 m or more in height and 3 m or more in diameter. Tower silos containing silage are usually unloaded from the top of the pile. An advantage of tower silos is that the silage tends to pack well due to its own weight, except for the top few feet. Well-prepared silage is bright or light yellow-green, has a smell similar to vinegar and has a firm texture. Bad silage tends to smell similar to rancid butter or ammonia. Natural microorganisms turn the sugars in the plant material or any added as molasses into weak acids, which then act as a preservative. The result is a sweet-smelling, moist feed that cattle like to eat once they get used to it. Tube silage should be stored under shade, for example in a store. Rodents like rats that could tear the tube need to be controlled. When feeding, open the tube and scoop a layer and remember to re-tie without trapping air inside. When feeding from the pit, scoop in layers and cover after removing the day’s ration, making sure the pit is air tight. Drainage from the top should be guided to avoid rainwater draining into the pit. When feeding from the above-ground method, open from the lower side of the slant, remove the amount you need for the day and re-cover it without trapping air inside. To avoid off-flavours in milk, feed silage to milking cows after milking, not before, or feed at least 2 hours before milking. Nutrient losses may occur during silage making. In the field during cutting, losses due to respiration during wilting will be about 2% per day. If it rains, leaching may cause some loss. Overheating due to poor sealing gives a brown product, which may smell like tobacco and result in severe damage to nutrients e.g. proteins. 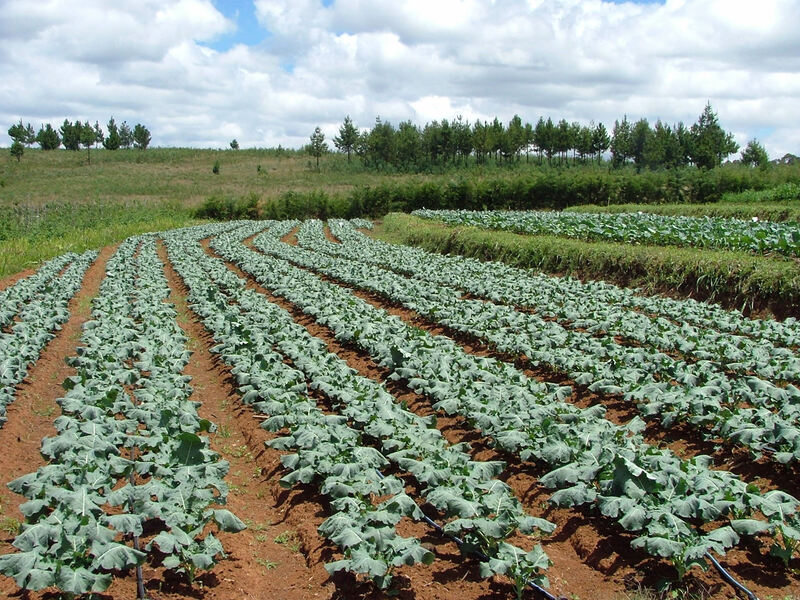 Effluent losses of 2–10% that occur from moisture seepage contain soluble and highly digestible nutrients; seepage should be avoided by wilting the herbage. During silage preparation, different types of additives can be added to improve the quality. These include fermentation stimulants. Some crops may not contain the right type or the right number of lactic acid bacteria. Bacterial inoculants and enzymes can hasten and improve fermentation by converting carbohydrates to lactic acid. Most inoculants contain Lactobacillus plantarum. Fermentation inhibitors include acids such as propionic, formic and sulphuric. Inorganic acids are more effective but are strongly corrosive thus not recommended. Of the organic acids, formic is more effective than propionic, lactic or acetic. Substrate or nutrient sources (grains, molasses, urea or ammonia) are used when there are insufficient soluble carbohydrates in the material to be ensiled (e.g. legumes, Napier grass, crop residues). They are also used to increase the nutritive value of the silage. Molasses can be added at about 9 kg/t of silage. Note: Use of additives is not a prerequisite for making good silage, but it is good for problem crops.